The X PRIZE Foundation’s Competition in Honor of Famed Astronaut Rewards High-School-Aged Teams That Develop an Original Concept to Benefit Personal Spaceflight. The X PRIZE Foundation announced the availability of online registration for a new education competition designed to interest students in space, science and technology. The Pete Conrad Spirit of Innovation Award, named in honor of the celebrated Apollo astronaut, will be presented for the first time at this year’s Wirefly X PRIZE Cup in October. The award will be presented to the high school team that develops the most creative, new space concept to benefit the emerging personal spaceflight industry. Teams of three students will be required to submit graphical representations, technical documents and business plans of concepts that can accelerate the personal spaceflight industry. Examples of concepts could include new space suit designs and accessories, advanced food items, zero-gravity games, or vehicle cabin design for a better passenger experience. The first place team will receive a $5,000 grant, followed by $2,500 for second place and $1,500 for third. 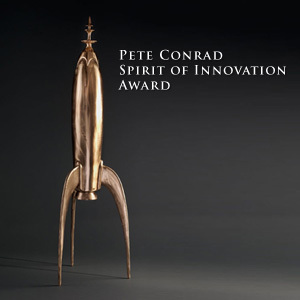 The Pete Conrad Spirit of Innovation Award is both the world’s premier student prize for innovative aerospace concepts and the premier educational tool for exciting and involving students in the rapidly growing personal spaceflight industry. The award creates a new level of excitement and dynamic participation in all fields of science and technology. It also provides an unparalleled opportunity to connect the most innovative students with the companies and entrepreneurs who are leading the way in opening the space frontier to the world. The award itself is a large, bronze rocket ship trophy, created especially for this competition by Erik Lindbergh, artist, aviator and grandson of famed aviator Charles Lindbergh. Students will also receive smaller individual rocket trophies. Student team members must be between the ages of 13 and 18 by Sept 15th, 2007. Teams must be registered by the final registration date of Sept 7th, 2007. All team members, including the team advisor, must be United States citizens. For more detailed information and to register, please visit http://space.xprize.org/x-prize-cup/conrad_award/. Charles “Pete” Conrad, Jr. was the third man to walk on the moon and served on Gemini 5 and 11, Apollo 12, and Skylab 2 missions. Conrad was the recipient of the Congressional Space Medal of Honor, awarded for his rescue of Skylab. He was posthumously awarded the Ambassador of Exploration Award by NASA in 2006. The Wirefly X PRIZE Cup is an annual two-day air and space exposition. This year the Cup will be held in conjunction with Holloman Air Force Base in Alamogordo, NM to create the first ever Air & Space Expo with “live” fire / fly demonstrations and competitions. This event is free and open to the public and will be held on October 27th and 28th from 10am to 5pm. Launch and air show demonstrations will feature Rocket Racing League’s X-Racer, Air Force single-ship demos including F-22, F-16 and F-117, as well as the return of the Northrop Grumman Lunar Lander Challenge — a two-level, $2 million competition requiring a vehicle to simulate trips between the moon’s surface and lunar orbit. Nine teams are registered for this year’s competition, with NASA funding the prizes through its Centennial Challenges program. Additionally, visitors can tour a massive ground display featuring space and rocket exhibits and Air Force aircraft. For more information, please visit www.xprizecup.com or call (310) 576-3473.